AMARILLO SKY APOLLO L1497189. Born: 4-1-2009- 6-2014. He was fancy in looks and pedigree. Apollo had been siring beautiful and fancy kid crops. His first crop of milking daughters have lovely, high and tight udders with good medial suspension and are milking well. Apollo placed 3rd in all three rings at the SWMDG Club's Fall Frenzy Buck Show in Neosho, Mo. on 10-30-2010. Pictured to the right is the dam of Amerillo Sky Apollo L1497189. 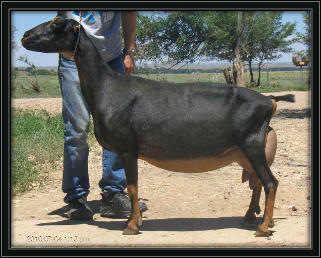 His dam, SGCH MOONGLOW RD LADY GUINEVERE L1310404, was appraised EX 92 EEEE in 2010 as a 5 year old. 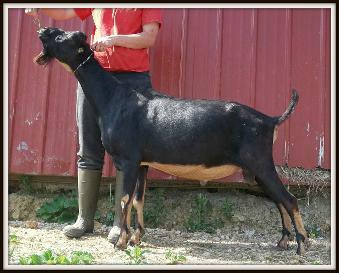 She is sired by SGCH LUCKY*STAR'S QK RAZZLE DAZZLE L1218023, the 2005 ALC Supreme All American Buck who is appraised at 91EEE. Guinevere is owned by J & R Lamanchas in Boone, Co. This lovely 2011 daughter of "Apollo", TE-ILTCOHE APOLLO'S AEDAN E1549384 is a fine example of the style and quality doe kids "Apollo" is siring in our herd. This pretty Apollo daughter is Te-Iltcohe Prallo Gwiredd E1676305. 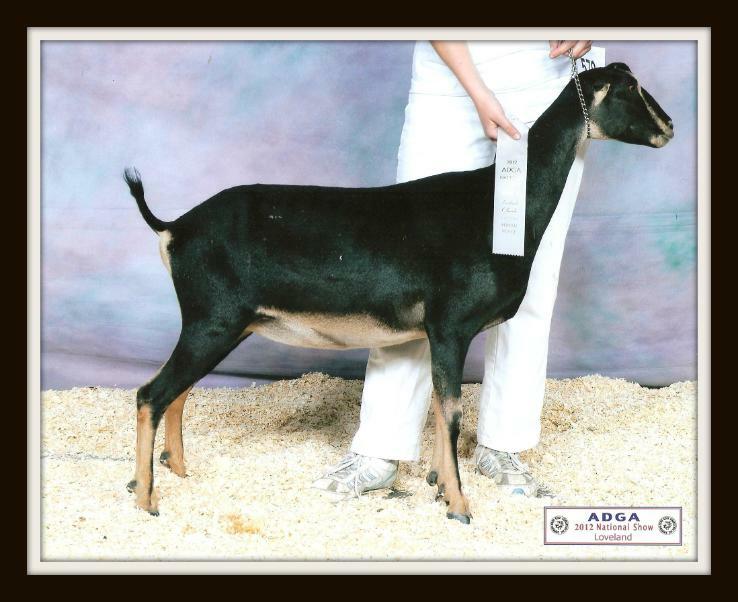 She was our 2014 star of the show season with an 8th place at Nationals, 2nd and 3rd placings at the Oklahoma State Fair and the Tri-State Fair and Rodeo in Amarillo, Tx., and two Jr. Recorded Grade Grand Championships at the SWMDGA annual Quad Show, Springfield Mo., and the Mo. State Fair, Sedalia, Mo. 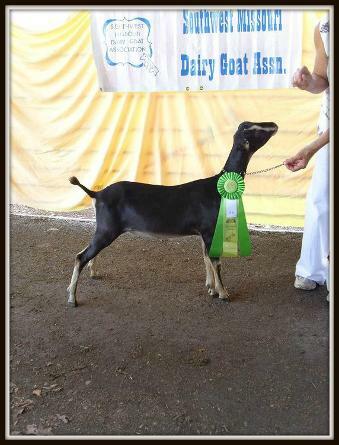 In 2015 she was Jr. Grand Champion at the Heart of the Ozarks and Ozarks Empire Fairs. 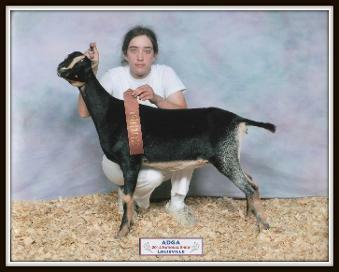 As a Junior doe she never walked into a ring in her home state with out taking a championship.